Call our membership department at 615-760-2020. As you can see from the graph below, over 94% of our operating revenue comes from the financial support of our local community. 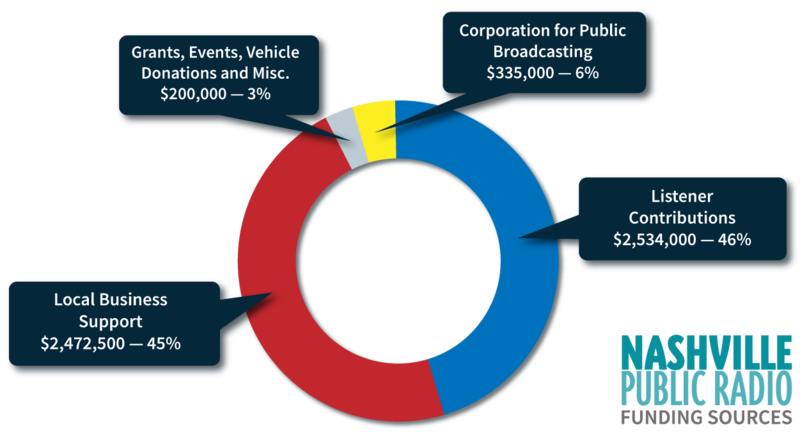 Corporation for Public Broadcasting covers only 6% of our operating revenue. We receive less than 0.25% of our funding from state and local government. * Put simply, your contributions make a big difference. *In fiscal year 2018, we received a $4,200 grant from the Tennessee Arts Commission and a $6,500 grant from the Metro Nashville Arts Commission for our Local Arts Broadcasts on 91Classical. We also received a $2,500 Arts Build Communities grant for our podcast Versify (funded by the Tennessee General Assembly and administered in cooperation with the Tennessee Arts Commission and ArtsBuild). You can reach our Membership department by phone at 615-760-2010, or just use this form to send the membership department an email.